Tour Inclusion: Private transportation from Honfleur or Le Havre, private guide service, taxes, tolls, parking. Departure Point: Honfleur or Le Havre. Other departure points available, inquire. Customize this Calvados and Honfleur tour as needed. Private transportation for bigger groups are available – cars, vans, buses for private transfers and tours. 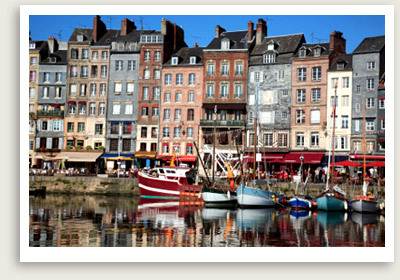 Your shore excursion from Honfleur or Le Havre starts with a private Honfleur tour. At the heart of the charming port town of Honfleur, the old dock is full of character, from its old crooked-faced slate-fronted houses to the art galleries and cafes some located in converted salt stores. Eugène Boudin and Claude Monet were among the famous impressionist painters who drew inspiration from the Honfleur port. You will have time to visit a few sights in town, perhaps St. Catherine’s Church, which is the largest wooden church in France, built by the town’s shipbuilders in the late 15th century. The Eugene Boudin Museum in Honfleur, set in a 19th century chapel, will be of interest to art lovers. This shore excursion also takes you to Beuvron-en-Auge. A private tour with an excellent guide and private transportation makes for a pleasant day. Beuvron’s villagers take pride in keeping up their architectural heritage: multi-colored, half-timbered homes best exemplified by the 16th century Vieux Manoir in the village’s oval shaped square. The hilly town, dotted with cows and apple trees. Your private tour guide will take you on a short walking tour of the town center.